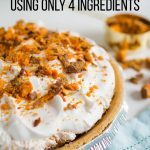 You only need 4 ingredients for the easiest ever Butterfinger Pie. Mix 5 crushed butterfingers, softened cream cheese and 8 oz of Cool Whip together. Put into graham cracker crust. Spread remaining Cool Whip on top of pie. Crush final Butterfinger bar and sprinkle over the top.